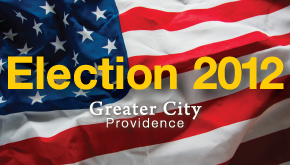 Update: All the ballot questions in the City of Providence passed. Do you ever get to the polling place on election day and wish that there were more things for you to vote on? Perhaps a long list of issues for you to read and decide about? Well if you live in Providence then November 6th is you lucky day, the City has 11 questions on the ballot in addition to the 7 questions the state has. Perhaps one should think about these questions before election day, so here are those ballot questions. “City” shall mean the City of Providence, in the County of Providence, and the State of Rhode Island. “Council” shall mean the duly elected city council of the City of Providence. “Domiciled” shall mean that place where a person has his or her true, fixed, and permanent home and principal establishment, and to which whenever he or she is absent has the intention of returning. Mayor. Whenever the word “mayor” is used, it shall mean the mayor of the City of Providence. “Quorum” shall mean a majority of the members of a public body or duly appointed committee. 10. Shall charter review commissions be appointed as of September 1, 2021, and every ten years thereafter? 16. Shall the Providence Emergency Management Agency and Homeland Protection Department be placed under the jurisdiction of the Department of Public Safety, under the supervision of the Commissioner of Public Safety? Thanks very much for this. Any chance you can point me to some background on these charter questions? I should mention on the Municode site, if you see for example section 101 it means Chapter 1, first paragraph. OK, same question as Jane L. I can read the language of the changes proposed. But I have no way to figure out if they’re a good idea or not, because no one is explaining why they should be changed, who’s pushing it, what difference it will make. I’m looking for something comparable to the voter guide on the state ballot questions. We are going to have a lot of people totally taken by surprise on election day, and it’s going to be a headache for the poll workers. Question 9 cleans up ambiguous language as to who does what. Question 10 moves charter review out of what could be an election year. 2020 isn’t but 2030 is. Question 11 eliminates foot dragging on implementing amendments. Question 15 makes the qualifications for a Public Property Director more flexible. I wonder if that means that Alan Sepe is going to be leaving and they already have someone in mind. Question 16 just qualifies what already is. PEMA already is part of Public Safety. Question 17 is trying to make it harder to bestow patronage. Lets see if that works. Question 18 is a result of this years redistricting fiasco where the public was allowed limited input to the new ward boundaries. I suppose there is some “politicking” involved in these amendments but I think most of them are “conspiracy free”. Very helpful comment Dan, thanks. The City has posted a page with more information/explanation about these questions. This comes from the Mayor’s office so think of that source as you will. So, if we vote no on 15, does Alan Sepe have to resign, or can he remain “Acting” for another decade? Councilman Sam Zurier and Common Cause RI’s John Marion make a case in the ProJo for why you should vote yes on Question 18. Information from the CIty of Providence about Question 8, the Road Bond. the responsibilities of the human resources department be changed to eliminate examining and approving all payrolls.